I try to make sure that most of the recipes I post here–and most of the recipes I make in general–are not overly complicated, difficult, or time-consuming. I try to keep the process simple and the active attention time to under an hour. I try to keep the dish-dirtying and utensil-using to a minimum. It’s just not practical to expect anyone to devote hours to cooking one recipe, at least not on a regular basis. But every once in a while, I think of a recipe that means a commitment of time an effort, and today, I’m unapologetically sharing one of those. 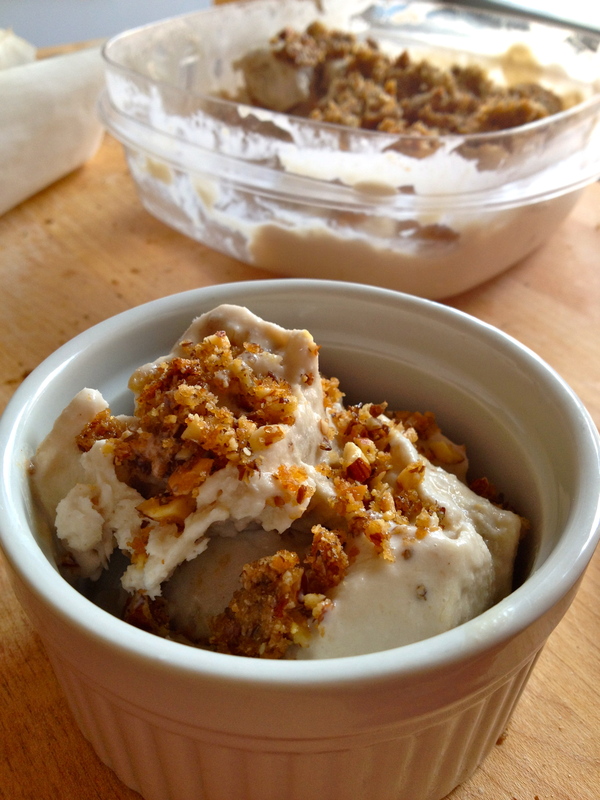 There are three separate components to this finished product: an ice cream base, an apple “filling,” and a crumble topping. And you’ll use a saucepan (twice), three bowls, an ice cream maker, and a baking dish before we’re finished. So when you read the recipe and raise your eyebrows a little bit, don’t say I didn’t warn you. Just know that I’m so absolutely crazy about this apple crumble ice cream that I’ll happily go through the process again and again, because I know the finished product is so damn good. First, make sure your ice cream maker is ready to go, according to its directions. For me, that means the bowl of the ice cream maker has been in the freezer for at least 24 hours before I even start the recipe. Once you’re ready to go, start with the ice cream base. In a saucepan over medium heat, combine coconut milk, brown sugar, cinnamon, and vanilla extract. Heat gently for about 5 minutes, stirring occasionally, just so the ingredients come together. Transfer to a bowl and put in the refrigerator overnight, or at least 4 hours. Some people seem to get away with shorter cooling times when they’re making ice cream, so maybe it’s just my ice cream maker, but for me it’s gotta be overnight. 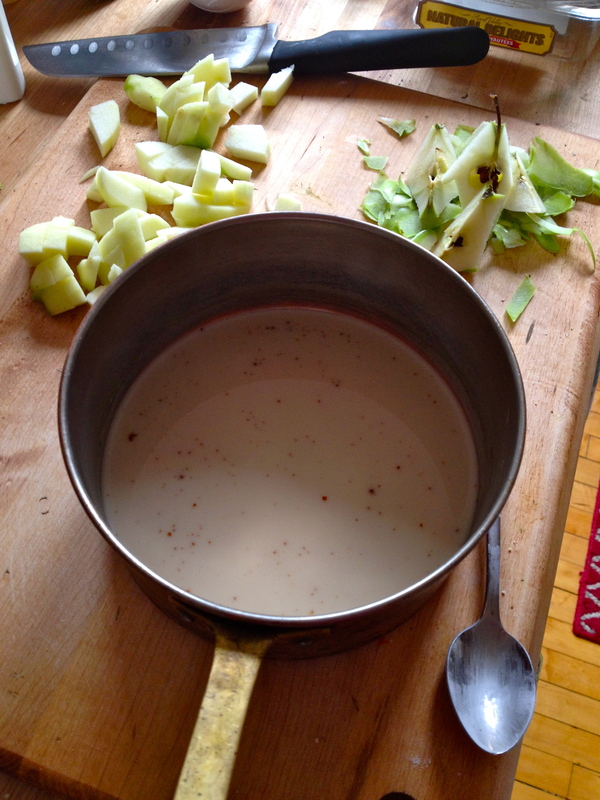 Next, the apple “filling.” Rinse out the sauce pan and add the apples and ¼ cup of the water. Cook over medium low heat, adding more water to the pan if the apples start to dry out. Cook for 40-45 minutes, stirring occasionally, until the apples are browned and softened. Be patient – this step isn’t a quick one, but it’s worth it. Once the apples are done, transfer to a bowl and put in the fridge. They should also be fully cooled before you start the next step. Once everything is cooled, you’re ready for the ice cream maker. Make sure you follow your ice cream maker’s directions for churning. 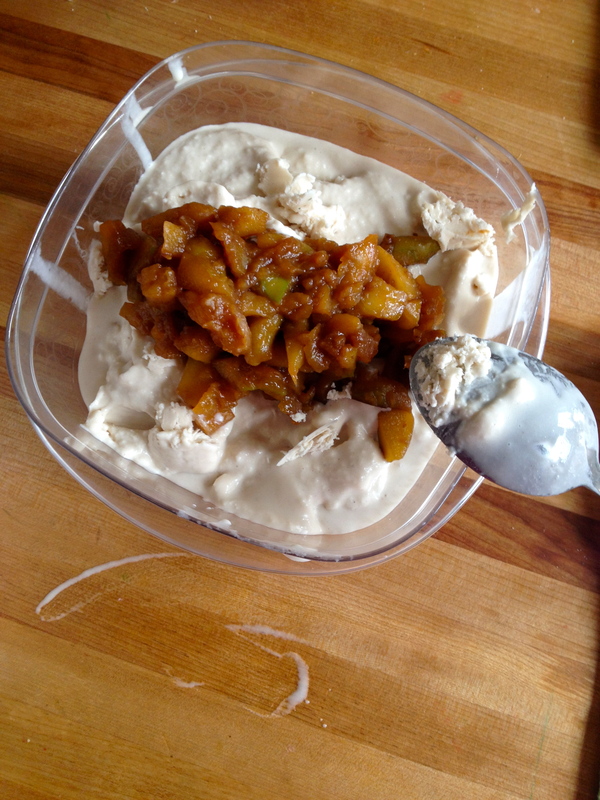 When the ice cream is churned, transfer to a container with a lid, stir in the apples, put the lid on the container, and freeze. Last step is the crumble topping. Preheat oven to 350 F.
Mix together all remaining ingredients except the butter. Then use a fork to work the butter into the nut mixture. 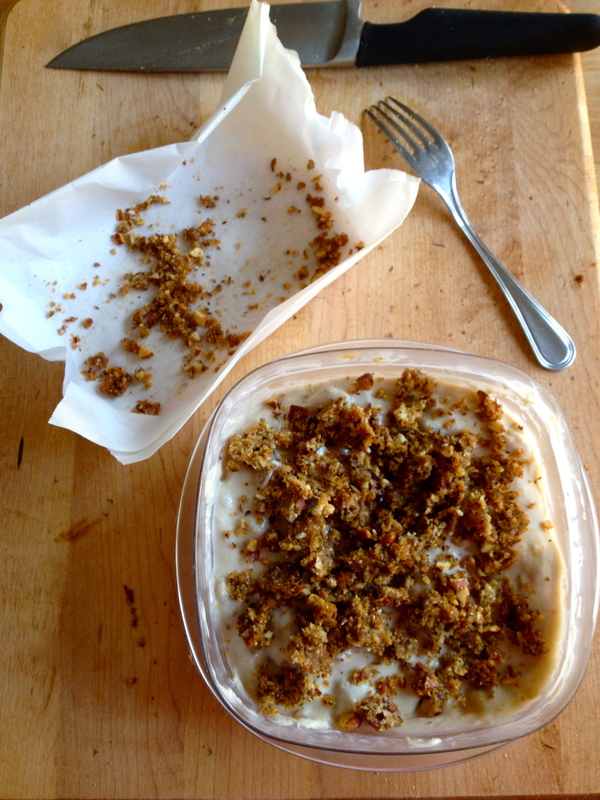 Line a baking dish with parchment paper and pour in the crumble, and bake for about 15 minutes, until golden brown. Refrigerate to cool. Okay, the home stretch! 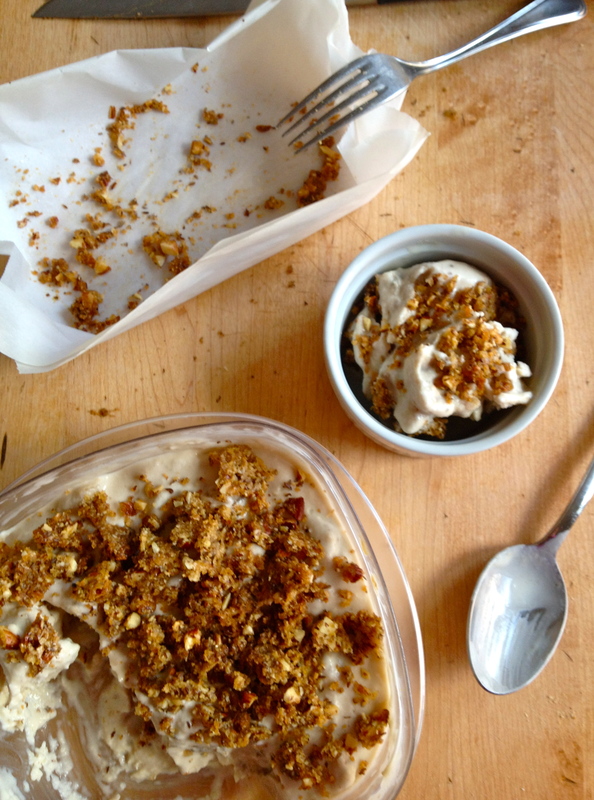 Use a fork to break up the crumble topping into, well, crumbles. You can either sprinkle over the whole portion of ice cream, like I do, or keep it separate and sprinkle over each individual serving. Yes, I know, it’s a long recipe with a ton of steps and a lot of waiting, but ohmygod is the result fantastic. Next Balsamic Chicken with Sauteed Vegetables and Lentils. Yummy! This looks incredible, thanks for sharing! Thank you :) Thanks for stopping by! Thanks :) The other recipe I made that day was a big failure, so thank goodness this one turned out well! !